Jobs for ex cops who worked as city police officers, deputy sheriffs, and federal agents where prior law enforcement report gross earnings ranging from a few hundred to over $20,000.00 a month; indeed, one former police officer reported gross monthly income in excess of what he received after cashing out his retirement; how much you earn is wholly contingent on how hard you are willing to work in conjunction with small business talent and a bit of luck. There is life after law enforcement—there is a new life with unheard of freedom and earning potential and even adventure. Leave your home office and return with hundreds or thousands of dollars in cash, check or credit card in 90-minutes versus a full month of clocking in and out; stand up in open court and argue against lawyers but not be a lawyer yourself; travel, meet interesting people and arrest them! 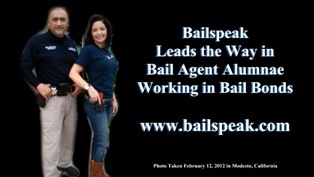 Bailspeak is a California Department of Insurance “Approved” Bail Bonds and Bounty Hunting Training School with hundreds of Alumni success stories and a reputation beyond reproach. Yes. There are economic opportunities for prior enforcement to live life free from the restraints of retirement, medical release and even termination! More and more ex-cops are arriving at Bailspeak’s California Department of Insurance Approved 20 Hour Bail Agent Pre-Licensing Training Events, and many of these fine men and women are under fifty years of age and with many in their late twenties to late forties and have found themselves struggling to secure gainful employment due to a very common malady, if you will, with prior law enforcement officers and deputies—overspecialization of life-long training. · One must meet the minimum hiring requirements that can, depending on the agency, range from graduating from high school to, at the minimum, having an AA in “administration of justice” or some sort of “criminal justice” degree totaling 60 college credits after having never been arrested and/or convicted of a misdemeanor or felony. · One must have fair to good credit to establish that one is not having financial troubles that may make one vulnerable to bribery or corruption. · One must be able to take and pass a polygraph, voice stress analyzer or some other form of lie detector exam. · One may be subjected to random drug testing common to people on probation or parole. · One must be able to take and pass a written test that goes to one’s ability to very simply write a misdemeanor or felony incident report subsequent to probable cause being established to take action to make an arrest. · One must be able to pass a physical consisting of strenuous physical activities. · One must also pass a curiously arduous background check complete with finger print, FBI, DOJ and maybe even visiting one’s kindergarten teacher to learn more about one’s behavior as a child. · One must pass a very subjective set of written and in-person psychological testing and interviews. · One must pass a very strenuous medical screening. · One must successfully negotiate an average of 900 hours of intentionally stressful academy training. · One must successfully then negotiate a field training period with a field training officer required to submit written evaluations daily and weekly. · Then, one must work to avoid liability in the form of citizen complaints, inter-agency complaints, conflicts with “the brass” and unions, and avoid law suits and internal affairs complaints. · While all this is going on, one must keep his or her personal life free and apart from “bringing embarrassment” onto the agency or “conduct unbecoming” or some other unexpected social calamity that can and does lead to termination from law enforcement employment. Stated differently, it is not just extremely difficult to become a peace officer but it is also extremely difficult to keep one’s job as a peace officer, and this past and current state of affairs is exacerbated by the potentiality of being tried in what today is called “the court of public opinion”should a cellular phone video go “viral” or common incident mushroom into a national incident where one is subjected to the whimsical demands of agenda driven political pressure groups that take about two seconds to make a determination and demand termination, prosecution and imprisonment before all the facts of an investigation, which could take months, are in. What is one to do if one spent one’s whole life preparing and enduring what it takes to become one of this Nation’s finest and is then terminated? What exactly is such a person educated, or trained or experienced to do that is suited for laterally transitioning over into the civilian job market or self-employment? Not much. Here we arrive at the good news. 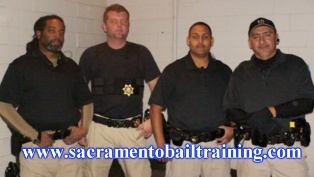 Prior law enforcement officers can be found in the ranks of America’s bounty hunters and bail bond company owners; indeed, the bail industry is that one very special place where a person who spent his or her whole life to be a peace officer can take those skills and transplant said skills into working in the bail bond industry. The one caveat is this: making the transition from government work to self-employment isn’t complete until one learns how to operate, as a private citizen, in the brutal organism that is the “Free Market,” where an inexperienced one can appear as a limping gazelle hobbling along the savannah to join the “circle of life,” absent proper education, training, and, especially, gaining plenty of experience as a small business owner. There is life after law enforcement if one is willing to open one’s mind and work and try and try to try and never give up. The prime question is this: Are You Ready? 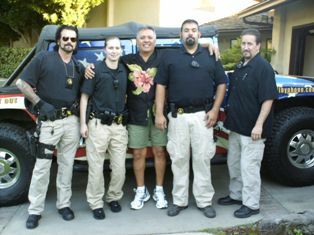 About the Author: Rex Venator is prior military and civilian law enforcement who struggled but ultimately succeeded in making a conscious decision to transition from working in the government to the private sector and is today thriving as a Bailspeak Bail Education instructor with California’s Fastest Growing, Most Transparent, Most Trusted and Number 1 Choice of California Bail Industry Job Recruiters in California—bar none. 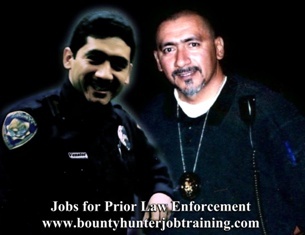 Prior law enforcement training and experience should not in and of itself be the deciding factor on whether or not to hire a bounty hunter, in my personal and professional opinion; however, prior law enforcement background is a major plus in terms of experience for bounty hunting thus creating a paradox for bounty hunting job recruiters. 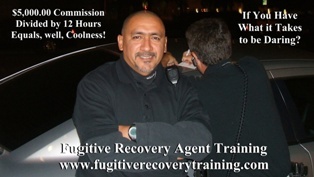 My positions on this subject arrives from prior military and civilian law enforcement training and experience, nearly a quarter century of real street training bounty hunting people who were/are prior and non-prior law enforcement, interacting with law enforcement personnel while bounty hunting, and, most importantly, working with prior law enforcement personnel in an educational setting since 1997 numbering in the hundreds and hailing from all over the United States—mostly California. 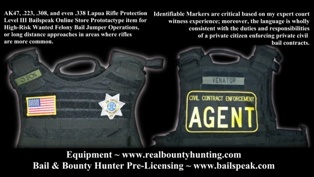 Private citizens who are legally working to apprehend a wanted bail jumper do not enjoy the protections afforded to sworn law enforcement personnel, but private citizens do enjoy protections that sworn law enforcement personnel do not enjoy; moreover, both may lose all protections if working in concert, thus there is another paradox—or is there? 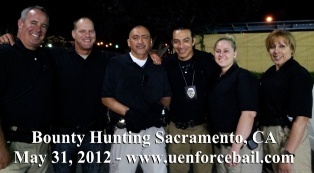 Private citizen bounty hunters and sworn law enforcement personnel who may each be hunting wanted misdemeanor or felony fugitives share the same goal, but the laws that govern how one or the other or both operate are not the same as a whole. There is no Yin – Yang or Black and White or Positive and Negative in these regards; the laws and published case cites that direct sworn law enforcement personnel and private citizen bounty hunters are often separate and distinct with each having nothing to do with the other. 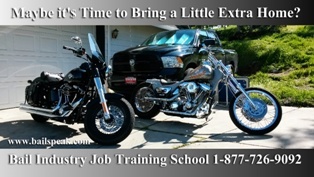 How does a bail bond or bounty hunter job recruiter determine if a person is good-to-go for bounty hunting jobs or presents as a tremendous liability? Is there a quiz or test or some other way to gauge one’s acumen to bounty hunting safely and legally? 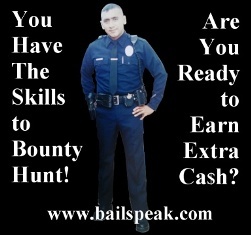 How does one determine if a bounty hunting school is ready to teach people how to lawfully bounty hunt? Please feel free to view a simple (at no cost), quiz that has always been on the Bailspeak Mother Website and requires no buttons to push and is just simple text. If a prospective hire cannot answer the Bounty Hunting 101 quiz questions then perhaps the next candidate should be given a shot and so on and so forth. Hunt Smart and Hunt Safe, Rex.